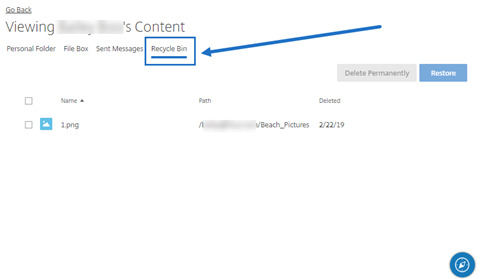 Any files or folders that are deleted from your account will be moved to the Recycle Bin. Deleted files will remain in the recycle bin for a brief period. Files in your recycle bin do not count toward your storage limits. It is not possible to recover a file after 45 days. If you delete a file from the Recycle Bin before the end of this 45 day period, your file cannot be recovered. Only Employee users may access the Recycle Bin. 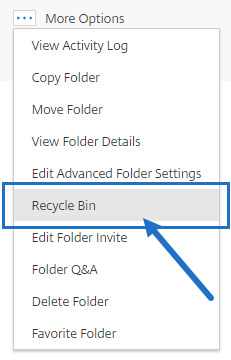 Every ShareFile folder has a Recycle Bin you can use to view recently deleted items, as well as restore items if needed. Folder Recycle Bin access requires the Admin permission on the specific folder. To restore an item deleted by someone else, access the Folder where the deleted file was stored. At the Folder menu, select More Options. Select Recycle Bin from the list of options. Click the Restore button. The item will be restored to its original location within the folder. Without the above permissions, you will not be able to see the “Access Recycle Bin” button in the screenshot below. 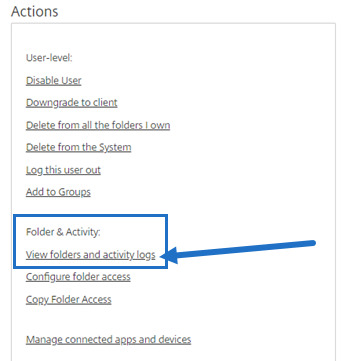 Access the desired user’s profile page, then, under Actions > Folder & Activity:, click View Folders and Activity Logs. 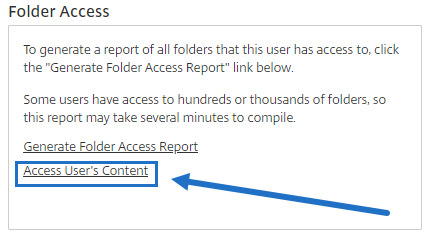 Under Folder Access, click Access User’s Content.